Jarekus Singleton is a young bluesman from Jackson MS. He’s certainly a hometown favorite, but his name is starting to be known in other places. His influences are not strictly “Mississippi” artists, but he is an invigorating influence to the blues scene in Jackson and beyond. 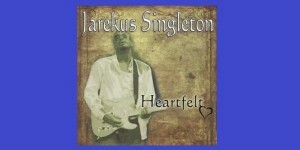 His debut album “Heartfelt” is a thoroughly-modern download-only album.